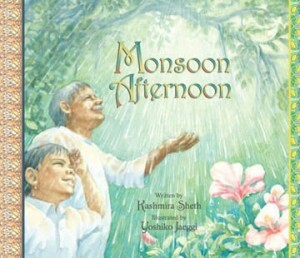 Monsoon Afternoon, by Kashmira Sheth, is a quiet little book that celebrates an act of nature most people find utterly annoying—rain. The book opens with a young boy living in India who peeks out of his window and notices black clouds rolling in. Even after drops of rain begin to fall and the ants, animals and birds scatter for cover, the boy begs everyone in his household to go outside and play with him in the rain. His grandfather—or his “Dadaji,” in their language, happily plays with him. As they play sail boat and other games, his Dadaji tells him why monsoon is important, and what it was like when he was a boy and the monsoon came. Yes, this is a quiet book, and one that encourages bonding between grandfather and grandson. It is a book about the cycle of life. This perfect lap book boasts beautiful illustrations by gifted artist Yoshiko Jaeggi, and is sure to be a wonderful way to bond with your child while teaching about the love of family and other cultures. Getting your own copy is as easy as 1, 2, 3. Just click on the icon and place your order.